In this modern day of technology almost every person has seen one of the terminator movies and which of us hasn’t dreamed of being in a similar scenario as John or Sarah Connor? 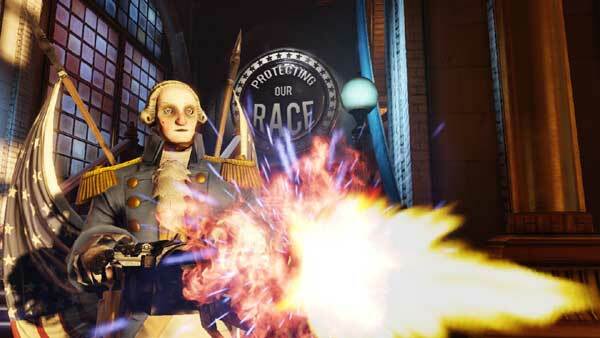 Well you might get a close enough experience with Bioshock Infinite as you have to kill a new enemy called the “The Motorized Patriot ” which are mechanical presidents such as George Washington who are equipped with nerves of steel and a minigun. Thank your lucky stars that you aren’t fighting Arnold Schwarzenegger otherwise you will have a hell of a time bringing him down, While Mechanical George Washington is no where near as indestructible as the terminators from the movies he has his Achilles heel too but you will need to be tactful and clever if you want to take him out without dying. These mechanical menaces will come in various shapes and sizes but they all have two similarities; they come with a minigun which can put bullets in you like a hot knife through butter and they will keep coming at you since they have no worries about their own survival which makes them fearless and their primary objective is your defeat. The good thing about these enemies are they are slow, can easily be distracted with the help of Elizabeth and some well placed lures to keep him from attacking you constantly with a rain of bullets all you have to do is shoot the gears covering him. The game is coming out October 16th 2012 and this shares the same month of release as Assassins Creed 3 and Medal of Honor: Warfighter. I can definitely say that October will be one hell of a month for the multiplatform video games.